This is one of those experiments that I didn't really investigate too much. 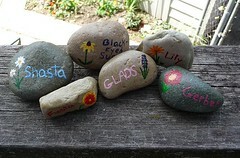 I used regular old acrylic paint and then sealed the rocks with lacquer. Why lacquer? Cause that's what I had on hand. We'll see how well it holds up.